Turns out the best machine in the gym is the one you’re not using. We’ve got the short session that will have a major impact on your workout. You probably know it. It’s the tall, slim machine tucked away in the corner of the club. Maybe you’ve seen someone on it (most likely with his personal trainer in tow) but chances are, it’s available right now. 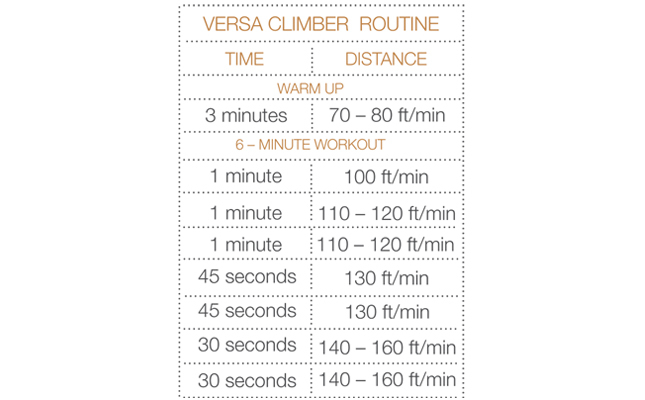 It’s called the Versa Climber — a vertical climbing machine that mimics hauling it up an extremely steep mountain or scaling a (very) tall wall. And spending just a few minutes on it torches major calories (between 10 and 20 per minute depending on intensity), significantly increases your aerobic capacity and pretty much tones you from head to toe. So why do we all avoid it? Because it’s really hard. 1. Keep your hips back while climbing to more efficiently target your glutes and help you avoid knee pain and potential injury. 2. Do not bounce side to side. Engage your legs and core to keep hips stationary — just as you would when riding out of the saddle in a cycling class. Not only will your movement be more efficient, but you’ll also target your abs. 3. Think push and pull. As you push up with the right arm, pull down with the left so each is assisting the other. 4. Move through a full range of motion. It’s common (and much easier) to try and move just a few inches up and down, but going bigger with your arms and legs means your muscle groups are working harder and burning more.